The 4 Point Aim Drill is a fantastic drill that teaches a player to adjust his or her aim on the spot to various targets. Using this drill repeatedly on the practice range will help you to adapt to different targets on the course. The Easy Aim Drill teaches you a nice little trick to ensure that you are aimed directly at your target. It will help you to eliminate any second guessing and have confidence that your alignment is correct. The Proper Position Grip Check Drill helps you test whether or not you have your club positioned securely in your lead hand (left hand for right handed players). The Neutral Grip Test Drill is a simple drill you can do in just a few seconds with a friend to make sure that your grip is not too strong or too weak. The Grip Flexibility Check Drill shows you how to test the tension level of your grip to make sure you aren't hanging on too tight and that your wrists are maintaining their flexibility. The Grip Pressure Check Drill teaches you how to apply the ideal amount of pressure to your grip. Gripping too tight will rob you of flexibility and speed. Gripping too loose will cause loss of control over the clubface. The Quarter Drill for grip helps you to keep your hands connected and working as one throughout the swing. 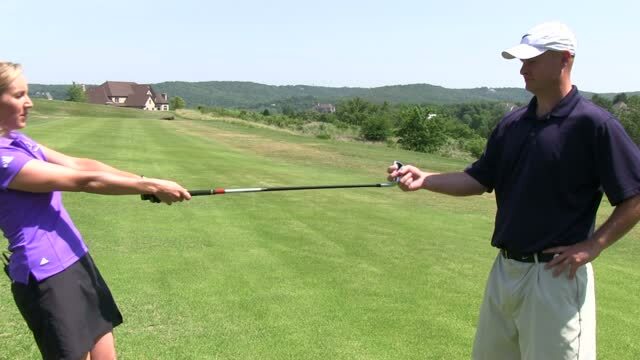 It will also help prevent early acceleration of your hands and loss of control of the clubface. The Tee Drill teaches you how to maintain a constant pressure on the grip with your lead hand (left hand for right handed players). This helps prevent changes in clubface position and early acceleration. The Thumb Placement Grip Drill teaches you how to correctly place your thumbs when taking your grip to maintain control and balance in the grip. The Club Behind Back Drill is a great drill to ensure you are setting up with the correct posture and keeping your spine as straight as possible. The Feet Together Drill helps train you on the proper ball position for each club in your stance. The T Drill helps train you on the proper ball position in your stance. The Railroad Tracks Drill trains you to align your entire body properly. The Head Against the Wall Drill allows you to monitor your head position through your swing to make sure you are not dipping or swaying which might lead to issues such as fat shots. The Stability Ball Drill helps ensure you maintain the proper posture and spine tilt throughout your swing.